Hi everyone! The number 10 has been a recurring theme for My Favorite Things this month as we are celebrating 10 fabulous years of MFT! To continue with the "TOP 10" theme, the Design Team is sharing a blog post that features their top 10 MFT projects of all time along! Project 1 – For this card, I had the fun idea to sponge the English Brick Wall stencil with white pigment ink and I still like the result! It really makes the elf pop against the dark background! Project 2 – This is a card I made using watercolors and inks! It’s a fabulous coloring technique to feature the Delicate Pretty Poppies stamp set. I love how it turned out! 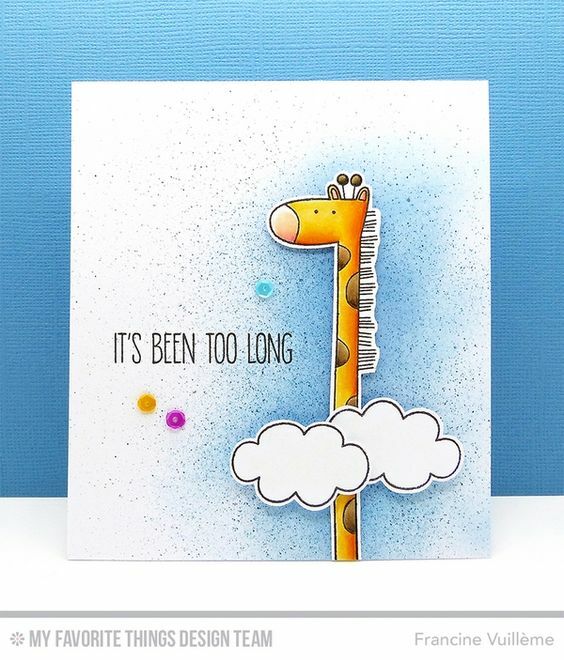 Project 3 – I’m in love with this super cute giraffe from the Sweet Safari stamp set! I remember that I immediately knew how to put the elements of this card together. It was obvious! Project 4 – I love doing scenes and the MFT stamps are just perfect for that! There are so many sets that can be mixed and matched to create beautiful scenes. I love how I colored the sheep! Project 5 – Paris and cooking… the perfect combination! 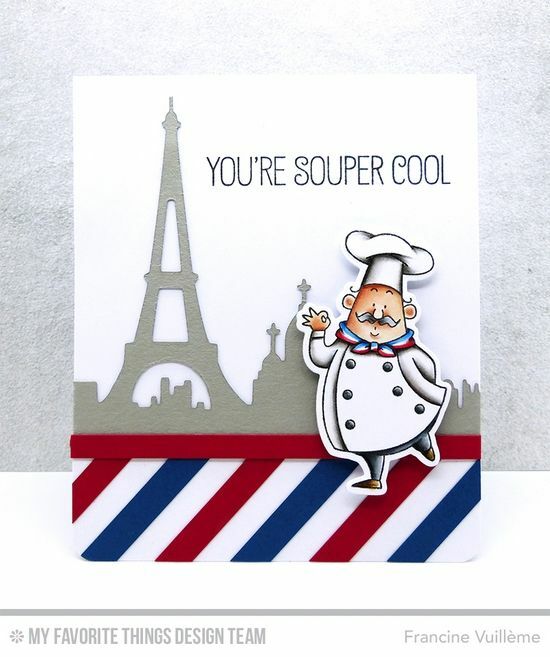 These chef stamps from Birdie Brown are really unique and super cool! I had so much fun creating this card! 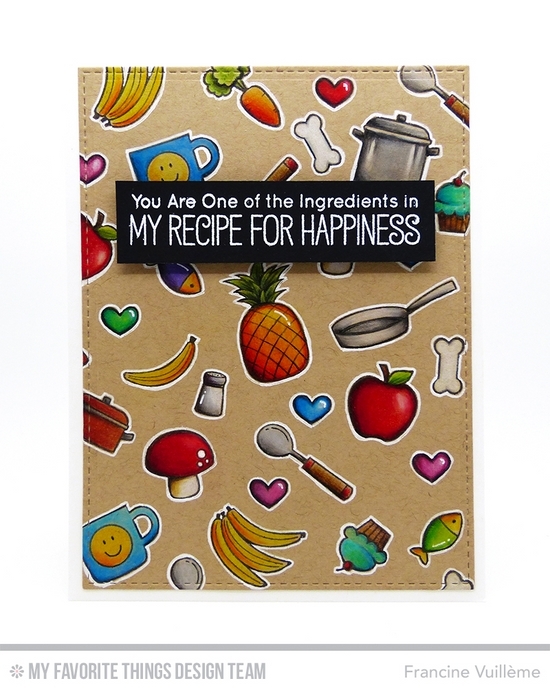 Project 6 – I love this happy card! Coloring rainbow circles with watercolors and inks are one of my favorite things! It’s so relaxing! Project 7 – The design of this card was obvious too! I LOVE sponging and blending colors together and it was really fun to create this scene. 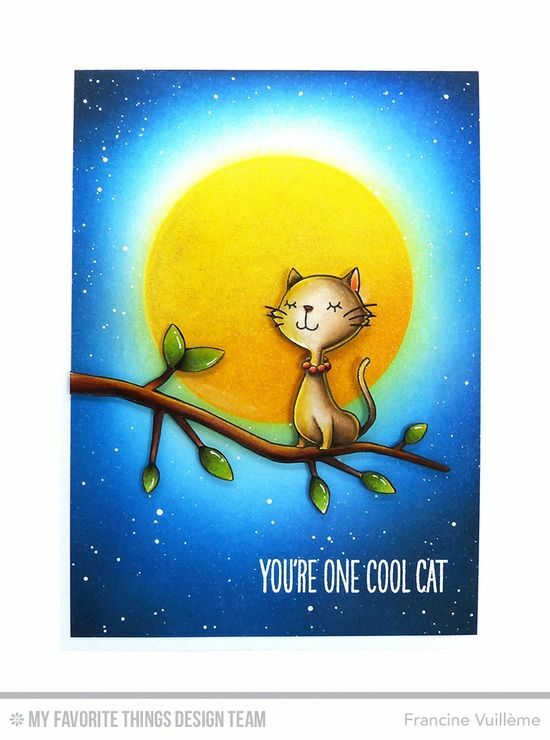 I also like this cat image because my cats often have the same attitude! Project 8 – You sure know how much I LOVE rainbows… LOL! I think, I created each month a card with a rainbow or using rainbow colors during the past years. 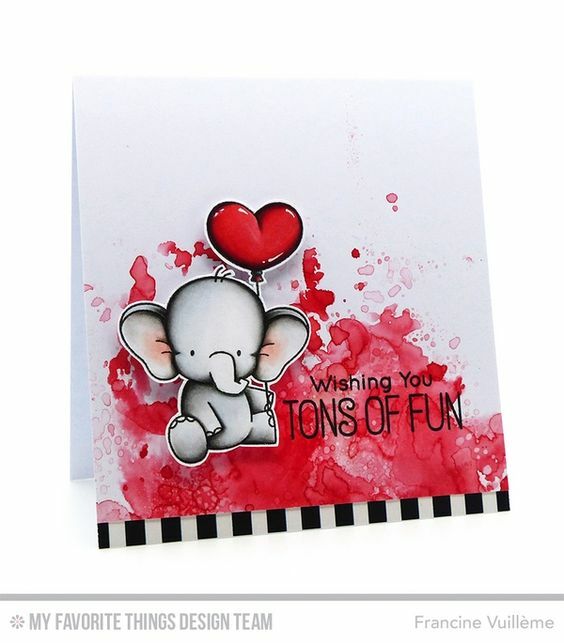 This is one among others but I really like how all of the elements match together (as well as the super fun sentiment)! Project 9 – This is a card I made for the MFT Camp Create 2! I colored the images from 11 sets with Polychromos, Prismacolors and Luminance pencils and it was super fun! Love this project! Project 10 – The Birdie Brown elephants are so super cute and I really love the background I made with the ink smooching technique!!! I hope you enjoyed my cards! Be sure to check the MFT blog to see the TOP 10 creations from the other team members! LOVE seeing your top 10 projects! I don't know how you could narrow it down to just 10! They're all my faves, too! Großartig !!! Ich liebe alle deiner Karten. Vor allem aber die Katze auf dem Baum, die ist traumhaft schön. Der Mond und der Himmel sehen so toll aus. Die Karte fand ich damals schon so großartig, die kann man sich immer wieder anschauen. AHmazing creations Francine. I am always inspired by your cards! Das schöne bei dir und deinen Karten ist, dass sie alle soooo verschieden und einzigartig sind. Es macht einfach immer wieder große Freude dir einen Besuch abzustatten. Each one is truly a work of art, #'s 1, 7, & 9 are my favorite! 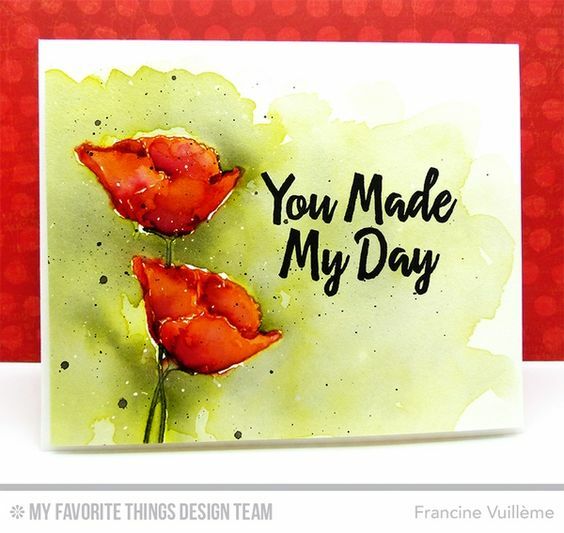 You are amazing Francine! Such a talent! Awesome cards !! 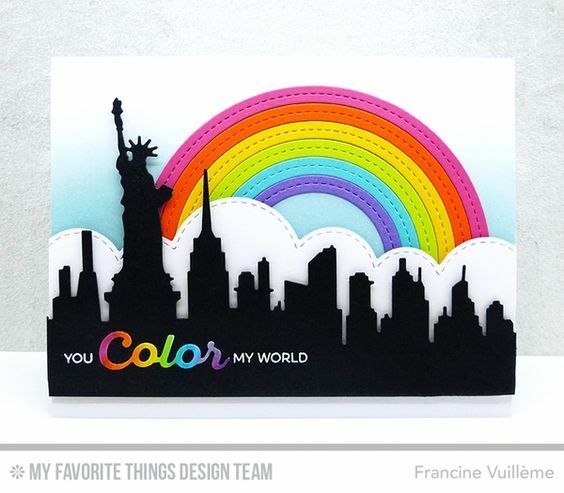 All of them are perfect with the theme,sentiment match with the image and your coloring is fabulous ! 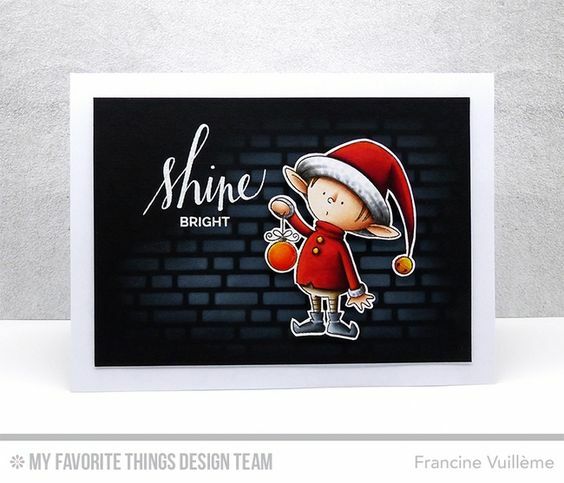 Such a fabulous collection of cards, Francine! And, so many of them are my faves, too :) Your designs, ink blending details, and pairing of your stamp sets is mind-blowing! Thanks so much for inspiring me...it's always fun to visit your blog!! !